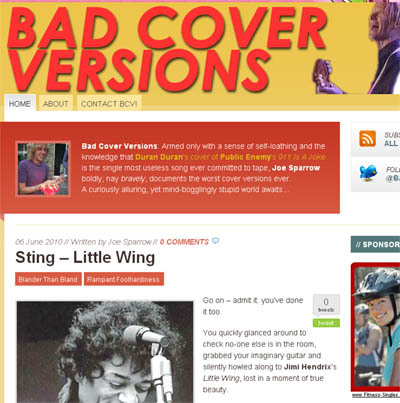 Brand New Blog Ahoy: BAD COVER VERSIONS! A New Band A Day celebrates creativity, daring and cunning. Rock, however, doesn’t do a lot of cunning, and even less creativity. What it does do is a lot of is stupid, as demonstrated by the truly dreadful decisions made when bands start to cover other band’s songs. Evidence? Take Duran Duran, surely one of the more feeble bands to ever attain worldwide adoration – and consider: would you ever recommend to Le Bon and co that covering Public Enemy‘s 911 Is A Joke was a good idea? No, neither would I – however, thankfully, someone did – and as such we can now revel in the video footage of what must be the most ridiculous cover version of all time. Stupidity of this magnitude would arouse anyone’s curiosity, and so here is the result: www.badcoverversions.com. It’s a blog that wholeheartedly celebrates the stupid, the misguided and the rankly moronic in rock, and acts as a handy repository of videos of the dumbest covers ever whelped. Dip in, and luxuriate in other such mind-boggling covers as Sting turning a two-minute Jimi Hendrix song into a ten-minute atrocity, rap-frat-idiots Limp Bizkit making George Michael’s Faith even worse than it already was, and – coming very soon – a country and western version of Fight For Your Right To Party, an 80’s teen idol performing a jazz-funk cover of Love Will Tear Us Apart, and much, much worse. Posted on June 6, 2010 by Joe Sparrow. This entry was posted in Featured, Featured Articles, Headline. Bookmark the permalink. ← Sunglasses: Mercurial Noiseniks; Awkward Comparisons Ahoy!